Have I said to all of you how much I hate this stuff. It is one of the original trial the devil sent to this earth to try and turn us from gods eyes. So my husband spent almost all day Saturday winching this hell spawn out by its thankfully shallow root system. Four big one's down the left side of my yard. I am hoping that by doing this and pulling runners as they show themselves I can eventually get it down to a minimum, if non eradicate it for ever. There were also hundreds of berried that fell on the ground, I'm tryng not to even think about them right now. I may spray the ground with some sort of shrub killer before planting. In addition, there are two more to take out behind the deck, they are huge and will cause quite a bit more problems for us. Sunday I helped him cart the debris to the road for pickup. I love getting an area ready for new plantings, I love planting the new plants but I hate waiting for nature to take its course, I would love to have the money to put in full-grown specimens. 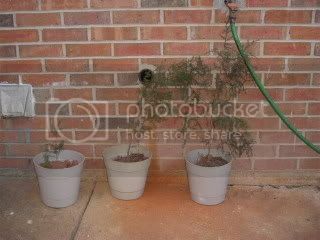 So under all the privet I discover three little cedar saplings fighting for life and I dug them up and put them in nice sized buckets to use later this summer. They were too close together to leave where they were. In the corner of that side, we have a nice sized cedar (probably the mother to the other three) that I trimmed all the branches off up to the top of the fence. It now has a very pretty trunk and will fill in nicely on the top now that the privet is no longer in charge. It already looks 100 percent better when you pull in the drive. 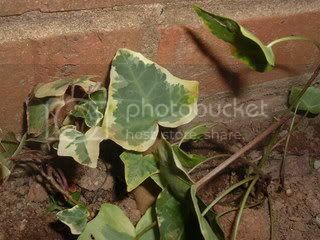 Also in that corner is a patch of never-ending beautiful variegated Ivy, the kind with three or four colors ranging from cream to dark green. 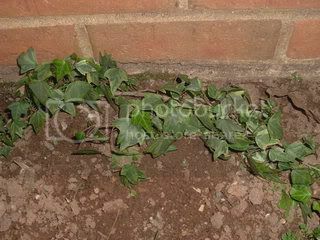 I have finally given in and I planted some more runners of it in the bed by the wall. I kept being indecisive about what to put there, so I will give the Ivy a go. I think its coloring and shape are just divine and I hung some from the wall to give the effect it would have and I liked it. 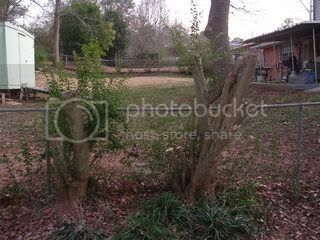 My husband and I still want privacy so I will transplant a bush ( Loropetalum) that I already have but will exceeds the space I initially planted it in. It will supposedly get to about 15 feet, so it should make a nice privacy piece. I always love to get your comments so keep them coming. 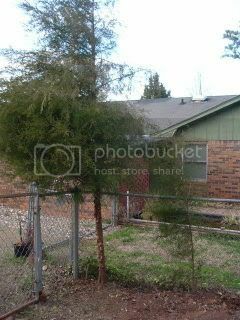 I like your ideas .I have a cedar tree in my side front yard a a big pine in my back yard and the sad thing is I am allergic to both and no I didn't plant them thaey were there.I have very few trees so I will live with them. Your flower beds are looking great.